Islamists militants who seized parts of northern and western Iraq last month posted images online Saturday of at least ten shrines and mosques they claim they have destroyed in the province of Nineveh. Photos show bulldozers knocking down Sunni Arab and Sufi shrines and explosives destroying six Shiite mosques. 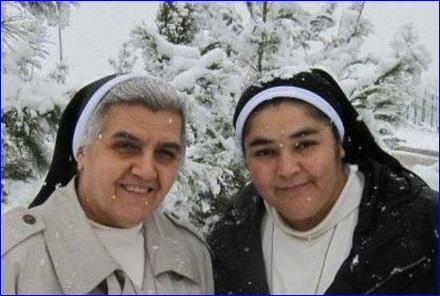 Sister Utoor Joseph (left) and Sister Miskintah, who disappeared on late Saturday, June 28 in Mosul (photo: Ishtar TV). Residents of Mosul, which is the capital of Nineveh, said the militants have also occupied two cathedrals belonging to Chaldean and Orthodox Christians. Crosses on the churches have been replaced by the black flag of the Islamic State of Iraq and Syria (ISIS), the group which recently declared the establishment of an Islamic caliphate.